I'm looking for eye makeup techniques to help my eyes look younger or more awake. I'm tired of looking tired. I tired eye makeup tips and highlighters and concealers, but I still seem to look tired and I think it's because my eye skin looks droopy and a bit wrinkled. Not sure what to do! I just want my eye area to look like it used to when I was younger. The skin seems loser and a bit droopy. What can I do? I don't have dark circles or even a lot of lines, but it just looks saggy. Do you understand what I mean? Any advice you can offer would be great. I think I do understand your problem. I have that too.....Little tiny lines on the tops of my cheeks directly under my lower eyelid. It's frustrating because most eye creams don't hide them. In fact, many creams (because they are greasy and shiny) actually exaggerate the appearance of lines. I tend to use those heavy, anti-aging eye creams only at night. I know in some way they can help repair the skin and prevent it from aging any further. But, I want something to use during the daytime that can help hide those tiny lines. 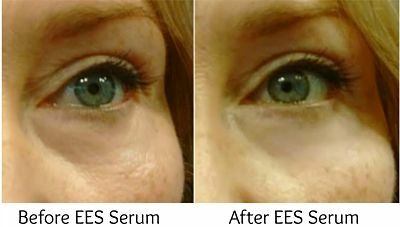 That's why I use the EES serum. It's the only eye lift serum that I can use that won't irritate or dry out my skin. Check out the attached picture. That picture is untouched! But yet it looks like someone photoshopped the wrinkles from under my eyes on the AFTER picture. I've been using it since 2012 and while I'm always willing to try other new products (you never know when something better comes along) I always go back to EES serum. It also works to reduce the look of puffy eyes too.